Partly cloudy skies early will give way to cloudy skies late. Low 49F. Winds N at 5 to 10 mph.. Partly cloudy skies early will give way to cloudy skies late. Low 49F. Winds N at 5 to 10 mph. Mia Crouch holds up her braided hair that will be donated to Locks of Love to make a hair piece for a child with medical-related hair loss. Mia Crouch is a 9-year-old girl with a big heart and little less hair then she had a few weeks ago. Mia had been growing her hair out for close to three years with one mission in mind. 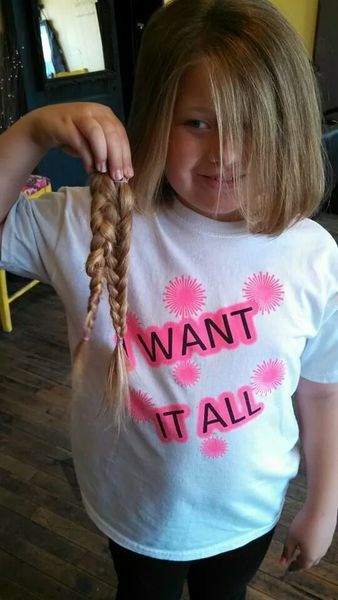 She wanted to donate her hair to Locks of Love, a non-profit organization that provides hairpieces for children suffering from long-term medical hair loss. Mia had close to 11 inches of hair cut and then donated to Locks of Love. It takes a minimum of ten inches of hair to make a hair piece for a child. Some people questioned Mia about why she would want to give up her beautiful long hair. For Mia the decision was simple. Hair loss in children is typically associated with chemotherapy treatments for cancer. However, most children helped by Locks of Love have lost their hair due to alopecia areata. Alopecia Areata is a medical condition that has no known cause or cure. The hair pieces can help restore children’s self-esteem and confidence. According to Shara Magson with Locks of Love there are some guidelines for donating hair. Hair must be at least ten inches and bundled in a braid or ponytail. Hair that is colored or permed is acceptable but hair cannot be bleached. Hair must be clean and completely dry before it is mailed to Locks of Love. Mia looks a bit older with short hair but it won’t stay short for long. She already has plans to let it grow long again. For more information about Locks of Love or how to donate hair visit www.locksoflove.org. Poor little cry babies get a life.